Garden maintenance, the war on weeds, call it as you wish it’s never going to go away. Here are my top tips for gradually changing your tactics so that you can spend less time working on your garden and more time enjoying it. The follow up to part 3 is to say OK now you have a bed how do I maintain that? The answer is to go back to a good old fashioned mulch. (see article on mulch) I do mean mulch and not the polypropylene film currently in use all over France. 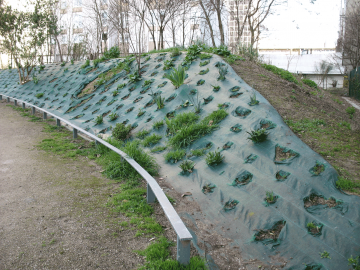 Commonly known over here as “la bâche verte” the plastic weed control fabric is sold as a universal solution to weed control. Please allow me to have a quick rant here. “La bache” is so unbelievably ugly to my mind that its colour alone is enough to banish it from ever being used in private gardens. In my opinion the success of the “bache” is entirely due to 2 factors. Firstly the general public has seen the film applied to large areas of public landscaping and so seem to believe that it is a professional solution to a problem. I do not agree, it is just a cheap, short term, ugly, polluting, non recyclable product which causes water runoff problems while it prevents some weeds growing for a short while. Municipalities use it because it reduces maintenance costs (costs which have never been an electoral favourite). It would seem that so many people are still gullable enough to believe that it is a real solution that I guess it sells easily and garden centres are happy to make a quick buck. Even when I write specifications for my clients gardens with real mulch, landscape contractors always seem to want to flog the dreaded ugly “bache”. Nobody seems to worried about how to remove and recycle it when its useful life is over . Please, please, never use “la bache” in a private garden . It can have its uses in specific contexts in invisible areas but simply in terms of its aesthetics, but who is going to enjoy sitting in a garden surrounded by expanses of green polypropylene?